2015 is gone now and with it came many advancements in the way we market online. More laws, more tactics to learn but best of all more money then ever was spent online then any year previous. Well simply put more and more people will be ordering online and as the economy starts its recovery this year you can expect an even higher amount of cash and credit to be flowing into online sales. 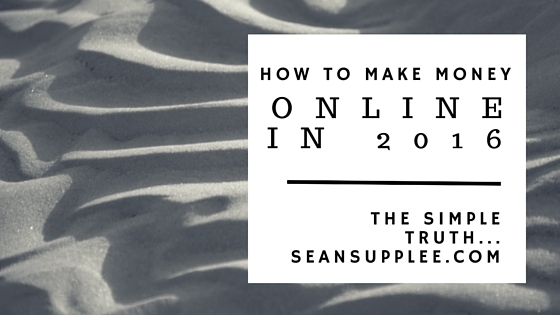 All you need to do is get your products and services in front of the right people to tap into this flood of cash and this blog post will go over how to make money online in 2016! Funny thing to hear right? But those who lead the way and try new things often become the ones that give up the soonest and lose the most. Millions have been spent already on ways to market effectively and there is a reason why companies have these price points, OTO (One Time Offers) offers and the way their sites are laid out. They have tested and tested many variations already and have what is converting the best. So instead of trying to be better and try some random weird theory first stick to what is proven to work and model what they are doing. If you want to spend some of your income on your own tactics then you can do so who knows you might stumble on to the next big thing. However first you need a solid foundation. I say it all the time yet there are still people out there not building their own mailing list. It does not matter how small your list is even 50 people on your mailing list can result in hundreds of extra dollars of income each month. If your not building your list then your missing out big time, not only on sales but on repeat customers and visitors to your sites and offers in the future. As always I recommend AWeber – I have been using them for almost 10 years now and have not had any issues with them what so ever. Easy to understand and newbie friendly but powerful for experienced users as well. The biggest obstacle to making money online? Its YOU! not this guy over here or that girl over there. You are holding yourself back by not taking action and instead using all that time and effort into blaming others. Step up your game get into action and start knocking it out of the park. Have a great idea for a product or service you want to sell? It used to take months and thousands to get a site or product online. There was hiring a designer, a programmer and then the hours it took to build the product. But now you can eliminate much of this and save money with a program that as been around for just a bit over a year now Click Funnel! Click here to start your free 14 day trial of Click Funnels and you’ll see what I mean when I say they have great customer support and a solid world class editor and program to back it up. I also offer coaching and building funnels for you via my Funnel Consultant program. It is very limited so if your interested check it out on my hire me page. This year start treating your online business with the right attitude and thinking of it as a real business/job which you need to learn, log the hours and put in the passion. Once you start thinking of your online adventures as a true business you will find yourself testing, buying, logging the hours in and starting to build a true income online.